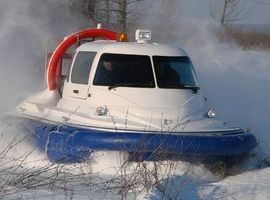 An air cushion craft (aerojeep) "Pegas" is an amphibian transport means designed for sea walks, capable of going along the water surface of any depth and the wave height up to 0,4 m, as well as along the land and ice of a relatively flat surface. While moving, it hovers along the surface, the flexible skirt touching its unevenness. An air cushion craft (aerojeep) “Pegas” is a transport means; its buoyant power that balances the craft's weight is created as a result of extra air pressure under the bottom. Increased pressure is generated by the ventilator. An air cushion craft (aerojeep) “Pegas” with the flexible skirt has amphibian qualities, i.e. is capable of going not only along the water, but also a relatively flat land, ice, swamped surface. Low surface resistance gives an opportunity to consider the air cushion craft traffic in the air cushion mode as traffic in the air according to safety rules, engine power and propulsion plant. The propulsion plant contains the engine with systems, additional mechanisms, ventilator drive and ventilator. The specific peculiarity of this unit consists in the fact that the air cushion and propulsive force are created by the single propulsion-plenum ventilator located on the nozzle in the aft.